At NZ Roadside Assistance, we provide hundreds of New Zealand companies and over two hundred thousand individuals with reliable, efficient roadside assistance, 24 hours a day, 365 days a year. We have a menu of Roadside membership packages direct to the public at cost effective prices! Our automotive expertise, state-of-the-art systems and specialised customer service, ensures you're getting the best roadside support with an average response time of 30-40 minutes. We can provide transparent, no-conflict programmes in partnership with our business clients and their customers to both support and represent their brand. View our Business Membership packages all call to discuss your requirements. Whatever industry you're in, we can design a personalised roadside assistance programme you can rely on to keep your staff and customers safe on the road. We're proud to be 100% New Zealand owned and operated, working alongside the country's top roadside service providers and automotive repairers. We believe our people are our biggest asset. Having a dedicated and experienced team ensures quick, reliable roadside assistance services when you need it most. 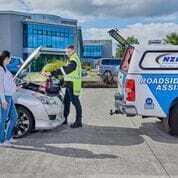 NZ Roadside Assistance was founded by our Managing Director with over 25 years in the Automotive Industry and 15 years in the Roadside and member services sector, both on a national and International level. Paul and his team of qualified automotive and customer services experts, have over 60 years combined experience and we are always pleased to meet and discuss how we can provide our services for you and your customers. Our operations manager is always available to meet or discuss any business requirements also. John Berry has 15 years in the Insurance and Roadside customer assistance industry and manages our operations and provider network department. NZRA manages a team of over 25 dedicated staff, working shifts 24 hours - 7 days per week providing quality service whenever required. Our flexible, personable approach means we work alongside you to design, implement and manage a roadside support programme specifically for your business. We pride ourselves on being 100% New Zealand owned and operated with local, professional staff who have the automotive expertise to get your people and vehicles back on the road quickly and safely. NZRA is the only roadside company corporately endorsed and supported by the Motor Trade Association (MTA). This strategic partnership means working with us gives you access to the best in the business; a large MTA assured network of service providers and more than 2000 automotive repairers nationwide. Our robust, diverse and reliable service provider network covers all New Zealand roads and in some cases, inaccessible off road and remote beach locations including Waiheke Island. We also service Great Barrier Island and Stewart Island on a case by case basis working in with car ferry schedules and availability. Providing first-class service is paramount, so if something doesn't quite hit the mark, we want to know about it. We use the MTA complaints disputes resolution system to give you the opportunity to voice concerns and have them resolved.